How is a supernova different from a hypernova? Learn about the different types of exploding stars that astronomers have identified. NOVA: A white dwarf star pulls matter off of a companion red giant star until a powerful nuclear fusion explosion occurs on the dwarf’s surface. The star is not destroyed and additional explosions can occur, a phenomenon called a recurrent nova. SUPERNOVA: Much more brilliant than a nova, a supernova can shine brighter than an entire galaxy for a brief time. 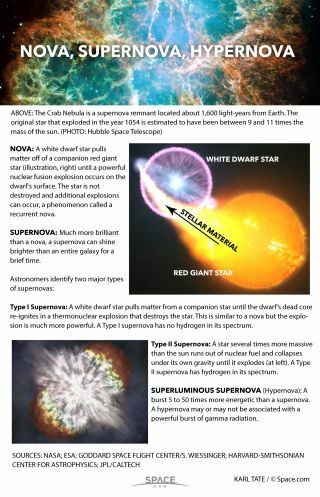 Type I Supernova: A white dwarf star pulls matter from a companion star until the dwarf’s dead core re-ignites in a thermonuclear explosion that destroys the star. This is similar to a nova but the explosion is much more powerful. A Type I supernova has no hydrogen in its spectrum. Type II Supernova: A star several times more massive than the sun runs out of nuclear fuel and collapses under its own gravity until it explodes. A Type II supernova has hydrogen in its spectrum. SUPERLUMINOUS SUPERNOVA (Hypernova): A burst 5 to 50 times more energetic than a supernova. A hypernova may or may not be associated with a powerful burst of gamma radiation.